Successful operations management projects require a leader who can coordinate a number of people from different organizations with different objectives and skill sets. Yet they need to work together toward the same goal to complete the project. Scope: This encompasses what the project should include and exclude. Final deliverables not mentioned in scope. Rough estimate of cost and timing: A firm may require other specific metrics such as net present value, internal rate of return, payback period, and so on. Chain of command for the project team and customer. Critical assumptions: Potentially critical obstacles and the impacts of violated assumptions. Write the proposal for the entire project as if you plan on actually completing it. And use a cross-functional team of experts to develop it. Locking the team in a room for a couple of days to write the initial pass often yields the best results. A stakeholder is anyone with a stake in the outcome of a project or initiative, including anyone who can stop a project. Stakeholders can be internal or external. Internal stakeholders can include your executive sponsors, your project team members, and those team members’ functional managers. Key suppliers may also be considered internal or external for various purposes, depending on how essential their participation is and how close your inter-firm relationship is. External public stakeholders include nongovernmental organizations, communities, and various government agencies. Identifying stakeholders and communicating with them on a regular basis is critical to successful project management. If you regularly communicate with stakeholders and they’re satisfied with a project’s performance, then they’re less likely to riot when there are glitches, or when it’s late or over budget. One of the first jobs of a project manager is to establish a communications plan. 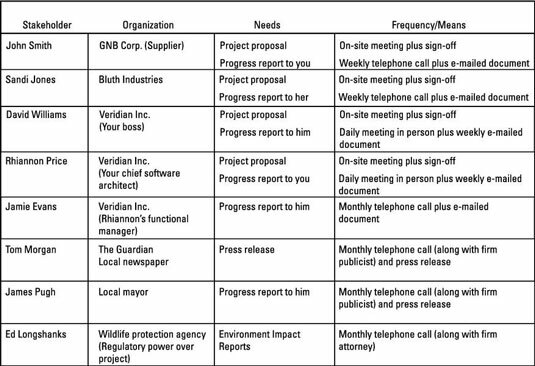 To do this, list your stakeholders, their organization, what you need to communicate to them, how frequently, and by what means. One of the biggest problems you face is managing your stakeholders and their managers. This is particularly true of your customers. So get them all involved early. These individuals must sign off on the project proposal. Otherwise, your chances to please the customer are essentially zero. You also must communicate with stakeholders frequently to manage expectations and prevent misunderstandings. You need to exchange formal documentation because it leaves a paper trail if misunderstandings occur, particularly regarding scope creep. But don’t abandon phone and/or in-person communication because these traditional platforms allow you to highlight particular problems and to provide clarification that’s difficult to achieve on the written page. Frequent progress reports are also essential. The amount of detail in your status reports depends on the size of the project and the preferences of the stakeholders in question. Moreover, you may want to manage some external stakeholders differently from others. What did we accomplish the prior week? What do we intend to accomplish the next week? What obstacles are standing in the way of completing the project, particularly for this next week? How far along are we in the project versus where we expected to be? Typically, answering these four questions is sufficient to keep the client in the loop and to deal with the most pressing potential problems. Managing a team of employees or other types of doers in a project is much like managing other kinds of stakeholders. Upfront participation and frequent communication go a long way on the road to successful outcomes. And it’s crucially important to establish crystal-clear responsibilities upfront. Responsible: These people do the work to complete the activity. At least one R needs to be assigned to each activity. Often, you’ll have more. Accountable: These people need to sign off on the work of the people who are responsible for completing it. You should have exactly one A per task. A person can be both an R and an A on a task. Consulted: These are people who should be consulted. Typically, they’re sought out for expert advice on the activity or they’re responsible for related activities in the project. Informed: These are people who need to be informed on an ongoing basis about the project. 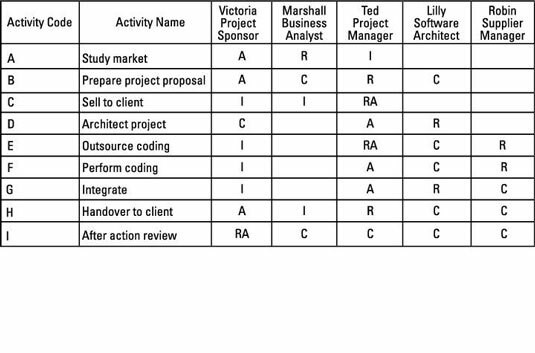 Project managers sometimes call a RAM a RACI matrix because of the initials used to fill in the matrix. Be sure to distribute these documents to at least the people with an R, A, or C next to their names. No individual should have more than one letter next to his or her name for a particular task, except possibly RA. There should also be a tight correspondence among the stakeholders, the communications matrix, and the RAM matrix. In other words, if the stakeholders show up on one chart, they ought to show up on both of them.